We are now in our fifteenth year of researching the majestic bald eagle. It has been an amazing journey. It is not just about capturing these majestic raptors in photographs but the knowledge we have acquired through observation. Being up close and personal with the bald eagles as they interact with each other and with other species has given us great insight into their lives. We love sharing these experiences with others…hoping to instill in them the need to keep these raptors protected even though they were removed from the Threatened and Endangered List. We need to remain ever vigilant regarding our environment and the toxic pollutants that can threaten all of our wildlife. I headed out early to the research blind. Yesterday there was already an eagle in the big tree at 8:00am. It is mild in the thirties with a slight breeze…and overcast. I had gulls in at 8:00 eating and carrying off meat. Then they left…came back around 9:00…then left. Now at 10:00 I have some ravens in but they are being fairly quiet as they eat. There are lots of little birds…finches…nuthatches…chickadees…blue jays….and woodpeckers. 10:00 the gulls came back in with a few ravens…but my 10:30 they are gone again. Strange winter…strange weather. Just looked out and there is an eagle in the big tree in the field at 10:30!!! It’s a 4th year eagle and there is a red-tailed hawk in the same tree. The hawk left about fifteen minutes later. There’s a big fox squirrel scampering around in the woods. Good to see at least one of them. Last year I had four black squirrels…but none this year. Yes…I just spent an action packed hour with my 4th year. He was nabbing pieces of meat out of the field across the road from the blind. He was then going back into the tree in the yard across the road to eat…surrounded by crows. I was able to catch him lifting off and swooping toward me…time after time. Now he is back in the big tree eating. I’m not sure he will come back in or not. He ate quite a bit. I was hoping for another eagle to come in to make a little more action. I know…I’m getting greedy now. It is now 12:15pm. I just had a red-tailed hawk come zooming in from the big tree in the field to land to the south of the blind. It sat for a minute then quickly went back the way it came…around 2:30pm. So the gulls and crows have all but devoured the meat….a few large pieces that the critters will get tonight. Of course the sun came out after my raptors were gone…but enjoyed the little songbirds. Thank goodness for the trail cam...we were able to catch a little bit of the action that took place at the research blind this week while I was at work. Sunday we had the red-shouldered hawk and an adult eagle on a very cold but sunshiny day. On Wedesday Michael witnessed four eagles...three adults and a 4th year doing battle. Two adults locked talons and released just before hitting the ground. On Thrusday Michael witnessed five eagles in and out of the blind. the trail cam caught several of them. Finally this week the weather was cold enough and ice on the lakes to bring the eagles into feed at the blind. We will see what Sunday brings. We are suppose to warm up and get rain...sadly. I headed out earlier to get out to the blind before daylight. The crows starting calling around 8:00 but didn’t show up till around 8:20. I do have an eagle in the big tree in the field at 8:30am. So hopefully I will get a visitor. It is a balmy 39 degrees and overcast with just a slight breeze. I looked out and the eagle is gone at 9:25am. The eagle is back at 9:45. Yeah my eagle did a low flyby at 10:00!!! Then back to the big tree in the field. Not sure just what happened but everything took off including my eagle at 10:30. I’m trying not to open more windows…so as to not spook the eagle. But unfortunately I haven’t a clue what happened to it. Now the gulls are back…but no eagle. Finally the eagle is back in the big tree. Hopefully, it will come in. It’s getting brighter out so would make for some great photos ops. Dang gone a few minutes later…and a few minutes later it is back. The gloom is settling back in…and it’s supposed to rain this afternoon. If it does, I will probably not stay out long. The raptors won’t come in at that point. Well, it is raining at 12:15pm. The eagle is sitting in the big tree in the field. I’ll keep an eye on it. If it takes off…so might I. My eagle flew around stretching its wings…then back on the tree at 12:40pm. Urrrggghhh! Darned eagle has been sitting in the tree…in the rain all afternoon. It finally flew…but must have been over the blind. I couldn’t see it till it headed back to its perch at 2:20pm. As soon as I leave it will come in. So I guess I’m being held hostage…again. Ok now I see what it’s doing. It’s duck hunting in the field at 3:00pm. So I’m calling it quits…can’t compete with fresh duck on the menu. I tried to get out to the blind before the eagles arrived but one was already sitting in the big tree in the field at 8:00am. Yesterday we had three in the tree at 9:00am and another soaring overhead. Unfortunately they didn’t come in to visit so we headed to the U.P. to find snowy owls. The gulls were the first to come in around 8:20 followed by the crows a few minutes later. Another eagle showed up in the big tree around 9:15am. The little birds are enjoying the bird bath and feed that Michael is putting out for them. We have finches, chickadees, juncos, nuthatch, starlings, blue jays, hairy…downy…and red-bellied woodpeckers. After sitting over two and half hours my one eagle disappeared. Then it came back…just stretching its wings. Finally at 11:45 they both took off…flew by…then headed southeast. URGGHHHH!!!! Yeah there’s another adult eagle out on the big tree at 12:20pm. Maybe now I’ll see some action. A crow flew off with a piece of meat. It took it into the woods and dropped it. I got on the eagle at is flew across the road. It landed in the brush…went down and got the piece and flew back just across the road to eat it. Now 1:00pm it has taken off again. Well, a gull just flew off with a piece of meat and dropped it out in the field to the far north. Guess what??? The adult eagle showed up and landed out in the field to eat it. Meanwhile a first year eagle shows up …screaming at the adult. The first year landed in the tree just across the road. The adult ended up joining it in the tree…where they chattered away at each other. Finally the first year decided to do a flyby…but then continued to fly to the east….probably landing in the pine trees on the hill. So we are back to a waiting game…waiting for something to carry off something. URGGHHHH!!!! The eagle in the tree is chattering. 3:00pm another adult eagle flew over…but not sure where it went. Poor red-tailed hawk just got chased by a swarm of crows around 3:10pm. Another adult eagle flying from the north over to the southeast without stopping. The other one was chattering at it the whole time. Now this one came flying out of the tree only to go way back to sit in the tree in the middle of the field. Seriously??? In a flash it was back chasing a gull around the field. Dang I missed it. Then it sat back in the tree in the yard. It had barely landed and it was heading my way….chasing another gull. It landed in the big tree…way in out in the field. I think it’s just going to hold me hostage for the rest of the afternoon and not come in. It is now after 4:00pm. No…it made a quick dash up to the tree in the yard where it is now hiding behind some branches….waiting. Finally the gulls left and the eagle was bored…so first it flew back to the big tree…then took off to the west for the night. 5:00pm. I got out to the blind before 8:15…in the middle of a white out. The temperatures are in the teens with below zero wind chill…winds out of the west…little fluff snow that is blowing and drifting. The crows arrived around 8:45 but are just sitting in the trees across the road. The little birds are enjoying the time alone…chickadees serenading me with hairy woodpecker drumming out the beat. Finally around 9:30 the crows decided to come over to my side of the road. They had been out in the cornfield…like they like to do. They didn’t come down on the ground till around 10:00…really jumpy. Hopefully that means there are eagles out there somewhere. Wow….I just watched several crows attacking another crow. I thought the poor thing was a goner. They were relentless. All the crows on the pile went up in to the trees. They all started screaming…like in an ancient gladiator film…the crowds cheering on the attackers. Now I know why they are called a murder of crows…hundreds of them were squawking their heads off. Amazingly the poor attacked crow came out of this one alive. We did just find out first dead crow…we think its neck was broken. Now I can see just how that might have happened. Well the all finally flew off after the fight was over and went to the cornfield to have a toast to the victor of that round. Now they are back and starting to get rowdy again at 10:30. It’s a cacophony of chaos! Yeah!! I have a 1st year in the tree just across the road. It didn’t sit too long before it came over the tree to the east of the blind. Then in made quick fly by…back in the tree…then finally came in. It had found a piece of carrion near the covey. It ate on it awhile then flew across the road with it. There another 1st came in to investigate what the first one had. They both flew back to the big tree. Finally the one without the food came in to the tree in the yard. It sat for quite some time before it came over to the east of the blind…but it didn’t sit long. It flew into the tree by the mini barn and sat for almost an hour. In the meantime the other 1st year came back to sit in the yard. Then around 11:50 an adult flew in and landed in the big tree across the road. It didn’t stay long but flew to the north. A few ravens have come in to stir up the crows…as if they need any stirring. All of a sudden the eagle next to the mini barn flew….into the maple in our front yard…where a 3rd year eagle was!! The 3rd year flew across the road into the big tree. The 1st year stayed in the maple and the other 1st year chattered from the tree just across the road. What a great day and it is only 12:30. Well, a car just drove by slowly and spooked all of my eagles. They are stilling all together in the big tree back in the field. But I have a feeling they will be in at some point today. It is time for a quick break to get ready for the next round. Well one just disappeared…and the snow is moving back in heavy. Another has disappeared but I spotted an adult flying then landing in a pine tree to the north of the house. Then I found a rough-legged hawk in the tree to the far east of the blind…and all before 1:00pm. Well RLH came in to the closer tree to the east then flew around to a pine tree. Then it flew off to the north followed by a barrage of screaming crows. I’m getting a little quiet time with the crows sitting in the trees…the snow gently falling and the hairy and downy woodpeckers chirping away at 1:30pm. I can still see one of the young eagles in the big tree across the road. My roughie is back sitting on top of a little maple tree….just sitting waiting for the crows to return…I guess. I think they help it know when the eagle is on the move…at 1:40pm. The rough-legged hawk continued to just sat as a raven spent fifteen minutes gronking at it. Then Michael came home and it flew to the west. The one young eagle is still just sitting in the big tree across the road at 2:10pm. Oh and my one foot gull is still in the area. It has been here for the last three weeks at least. It seems to do quite well with just one foot and a ‘stump’ for the other leg. I’m having some fun with the dark-eyed juncos, chickadees, nuthatch and little woodpeckers. Michael has but out see and peanut butter for them…along with the suet from the carrion. The sun is peeking out…bring on the raptors. No such luck…just gulls and crows came in…and my one eagle disappeared around 2:45pm along with the sun. Well the snow is back along with a murder of crows and the two adult eagles at 3:00pm. They are in the big tree out in the field across the road. They tend to just sit and try to deter the hawks from coming in. Finally I ignore the eagle….it takes off…I thought it would be in front of the blind but no…a rough-legged hawk is in the tree to the east of the blind. So where did the eagle go? Well a few minutes later I looked out…it’s back in the tree across the road. But now it is snowing so hard I can barely see either of them. Great I took my eyes off roughie. I just saw it take off but it didn’t come in front of the blind. It must have swung to the south of me. The eagle is still sitting in the tree just across the road…at 3:40pm. I look again a few minutes later and the eagle is gone. Is that it for the day???? Well, I can’t say that is has been a boring day. I just may have to come out tomorrow morning for a while…since only one of the five eagles ate...and the rough-legged hawk didn’t either. Yeah…we finally got nice snowstorm last night…at least five inches or more…with northwest winds. The temps are in the 20’s but windchill single digits. I got up early to get out here…but a hawk was already across the road in the big tree and the crows had just moved in. Of course everything flew off as I waded through the snow to get out here. But about twenty minutes later…they are moving back in. Hopefully it will be an active day. Well it is active but over a hundred crows squawking and carrying on. Finally around 10:30 they flew off…probably chasing a hawk. The red shouldered hawk was in briefly at 10:45am. Today is the first time I actually had any raptor...let alone the smallest one...actually attack a crow. My little red-shouldered hawk came in and landed...briefly on this crows back. The crow was not harmed. The hawk just wanted the carrion that it was on. I have always been amazed how tolerant the eagles are when the crows and ravens harass them...pulling their tail feathers...yet never hurt them...at least when I have observed them for the last fifteen winters. The gulls moved in with the crows after that. Finally around 11:00 we have an eagle in the big tree across the road! Come on in. Nope gone ten minutes later. Red shouldered hawk back in around noon for a few minutes…then chased off by the crows. I just caught a glimpse of a young eagle flying northeast at 12:10pm. Rough-legged hawk just landed in the big tree across the road at 12:15pm. Lots of blowing snow…but not snowing at the moment…but it didn’t stay long…the winds it really howling out there. The woodpeckers enjoy the moments when the crows have left…hairys and downys. My red-shoulder was back in around 1:00pm. It hopped around on the meat then flew back into the woods…again. It didn’t appear to be too hungry just wanted to harass the crows today. Around 1:30pm the crows all took off…yep…there was a red-tailed hawk flying over. With all of these dang crows around nothing is going to come in to eat today. URGHHHH! When the crows aren’t on the carrion pile they are out in the cornfield across the road…carrying on. Yeah my red-tailed came in for a few minutes at 1:45pm. It landed in the little maple tree then the dead tree…then on the pile. Of course it came in as the snow and wind picked up. It bounced around from carcass to carcass without eating anything…then took off. At least the crows have left the area for now…maybe something else will come in. There is a male red-bellied woodpecker working in the tree next to the blind. The hairy and downy are busy on the carcasses…around 2:00pm. The snow machine has kicked now around 2:15pm. Everything has left…even my little birds….interesting. They made a flyby around 2:40pm then gone again. It is really snowing and howling out there. Well, the little birds are back around 2:50pm. Well, I think it’s time to call it quits…nothing moving in this storm now…so I’m heading out at 3:15pm. Another winter day in Northern Michigan. The winds are strong out of the northwest with mostly cloudy skies. Temps are in the 20’s …perfect for raptors. I got out in the blind around 8:30am. The crows and gulls arrived around 9:00am. The rough-legged hawk flew over around 9:30. The crows are even being quiet today. Not much happening…even the weather is milder than predicted. Finally around 11:15 the sun came out and the crows came back in mass…but still nothing else. I just caught a quick glimpse of the red-shouldered hawk…but the crows chased it off. URRGGHHHH!! Roughie just flew over at 12:00pm. It is now out in the tall tree across the road. Very interesting day. I thought with the winds changing out of the northwest I would see more activity. It is spitting snow now this afternoon…maybe they will come in when the visibility gets bad…typical. Yeah…red-shouldered hawk in the pine trees at 2:00pm being harassed by the crows. It dropped quickly down into the little maple in front of the blind…hiding behind the branches. I focused on it for almost an hour. About the time I decided to relax and change position…it flew. URRGGHH!! It did land on the carrion and I got a couple of shots of that. It fed for almost a half an hour. Once again I tried to stay focused keeping my zoom in so I could snap the take-off shot. Are you kidding me??? I swear they know when you are not paying attention. Oh well it was fun to see it and know that it has a full crop thanks to us. 3:30pm and a red-tailed hawk is now in the tall tree across the road. We’ll see if it makes it in before dark. Strange day. Ok the red-tail just flew into a tree to the south of the blind. I was getting ready to snap a pic when it screamed and took off back to the big tree. Seriously??? It is now 4:00 and the clouds look like they are moving back in with snow in them. The first day of the New Year spent in the eagle blind. Life couldn’t be better. About seventy crows were on the ground around 8:45am when I came out. They flew off…but came back within minutes. By 9:30am I had a young rough-legged hawk do a fly by. Then a few minutes later it landed on the dead tree. It sat for a while being harassed by the crows. Finally it flew down on the carrion pile. It popped around from carcass to carcass….not eating much…just really spooked by all the crows. It finally left…and went across the road into a tree. Then it was just me and the crows. They flew off a few times…chasing the hawk no doubt. Then they disappeared for about twenty minutes. 10:30am and they are back raising a ruckus. I just peeked out the west window…a mature eagle is sitting in a tree just across the road!!! WooHoo, it’s on the ground a few minutes later!!! It ate a little then flew off. I know it will be back. Sweet!!! Rough-legged hawk flying over at 11:00am. The eagle is back across the road in a tree at 11:15am. The rough-legged came in and landed to the tree to the east of the blind at 11:45 and sat…and sat…and sat. Then around 12:15pm one of the gulls flew off with a piece of meat…and it dropped it in the field. Well, the roughie was off in a flash…dropped down…nabbed it and headed north…away from me. URGGHHHH…darn gulls. It’s snowing so hard that I can hardly see across the road. One o’clock and another gull took off with a piece of meat. From the north came the rough-legged hawk to chase it who know s where. It’s as lazy as the eagles. They like to wait for the other birds to carry something off…then attack. URRRGHHHH! Big raven just dropped picked up another piece of meat and took off with it around 2:00pm… dang birds. It needs to get really cold to freeze the meat down. It is 28…overcast…snowy but still mild. 2:15 an eagle flew over heading west….??? The crows took off…they are all in the cornfield across the road. The RLH took off headed north. What’s up???? A few crows, downy and hairy woodpeckers at 3:00pm….but not much else going on. The crows are just sitting quietly in the trees across the road. 3:45 the eagle is in the tree out in the field…probably just going to keep an eye out…but not come in today. I’m calling it quits at 4:15 getting darker and snow picking back up. HAPPY NEW YEAR! I had a long day yesterday at work…so it was after 9:30am before I headed out to the blind. Before I got out there two eagles…a mature and 2nd year did a flyby…along with a rough-legged hawk. The twenty plus crows and gulls flew off when I went into the blind but it wasn’t long before they were back. The temperature hovered around 28 degrees with a west wind. Sun…snow…sleet and clouds kept the day interesting…changing my settings on the camera. Of course there was lots of taking off and landing throughout the morning. Frequently the crows would take off…and I knew that a hawk was nearby. Sure enough several times my female rough-legged hawk flew by…with the crows surrounding and hassling her. The mature eagle did land in the big tree in the field across the road…but eventually disappeared. The rough-legged did the same thing later in the day. I had red-bellied, downy and hairy woodpeckers…some starlings…and even had fifteen sandhill cranes fly over the field behind. I could hear them throughout the day cackling in the distances as they fed in the cornfields. 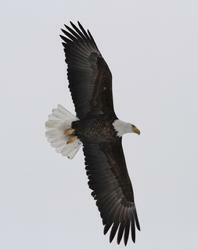 Around 3:00pm the eagle soared over escorted by a half a dozen gulls. Then finally around 4:00pm my roughie showed up in a tree to the south of me. She finally landed in the tree to the right of the blind. She did a flyby…landing temporarily in the tree right to the left of the blind. Then she flew into the little maple right in front of me…giving me some very nice photo ops. She flew off…never to be seen again. I finally called it a day with the clouds overtaking the sun as it sat. It was a good way to start the season back in the research blind.